Former Southampton boss Lawrie McMenemy has called the appointment of manager Ronald Koeman a "masterstroke" after the club's positive season. McMenemy won the FA Cup with Saints in 1976 and led them to their highest-ever top-flight finish of second in 1984. He has been hugely impressed with the Dutchman's achievements despite an exodus of players last summer. "The money was there. He used it wisely and brought in players he obviously knew," he told BBC South Today. Saints are seventh in the table but, with one game remaining, could still end the season as high as fifth, which would be the club's highest Premier League finish. All this followed a summer in which several players left the club, including Luke Shaw, Dejan Lovren, Calum Chambers, Adam Lallana and Rickie Lambert, following on from former boss Mauricio Pochettino's move to Tottenham in May 2014 and chairman Nicola Cortese's resignation five months earlier. McMenemy, 78, believes a combination of good recruitment and excellent management has helped the club recover from that exodus. 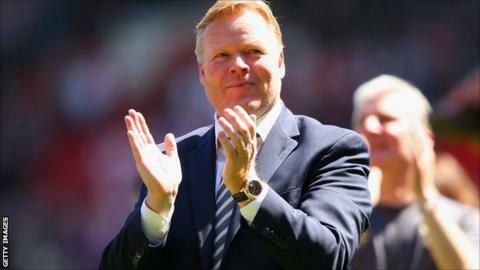 "The appointment of Ronald Koeman was a masterstroke," he added. "I was disappointed when I saw the door open and so many go out. "When the manager, chairman and players went, I thought 'this is unheard of'. Half of the outfield team that had done so well left. "As Les Reed [Saints' head of football development] has said, they already had a list of players lined up. They've spotted them and scouted them and that worked very well. "It's all to do with the management in the end, and he got them in and got the best out of them, and we can look forward with hope that we can do even better." McMenemy, who was speaking after being unveiled as a Football Foundation Ambassador, does not expect a repeat of last year with players forcing moves away from St Mary's this summer. "If I was a manager now and a player was under contract and I didn't want him to go, he would not go," added McMenemy. "I would say 'go away son, enjoy your summer holiday and I'll see you back here for pre-season training'. "The agent I would tell more forcibly. The agents are the difference, they talk about transfer windows, but they are at it all year round and often deals are done long before players have heard of it. "You have to be strong. As long as the manager is the one who decides who comes in and who goes out. That has got to stay and I'm sure with a manager like Ronald Koeman that will remain the case."